Staying ahead of others when it comes to tech stuffs is something I always love to do. So in this post I’ll let you know how to stay ahead of others on whatsapp. Facebook is reviving WhatsApp with the beta version, bringing new features regularly. Previously, If you wanted to be among the first to receive the latest WhatsApp features on your phone , you had to manually download each beta version. But now , App developer Javier Santos has created an app that enables you to automatically download WhatsApp beta releases. Before you can install Beta Updater for WhatsApp on your device, you need to enable “Unknown Sources” from the Settings->Security. Since the app is available on GitHub and not Google Play Store, you need to download and install the .APK file. To get latest WhatsApp features on your Android, configure the Beta Updater for WhatsApp on your device. Open the newly installed app and press the Settings icon (gear) on the top-right corner of the screen. Default settings give you a notification every time a new beta update is available. 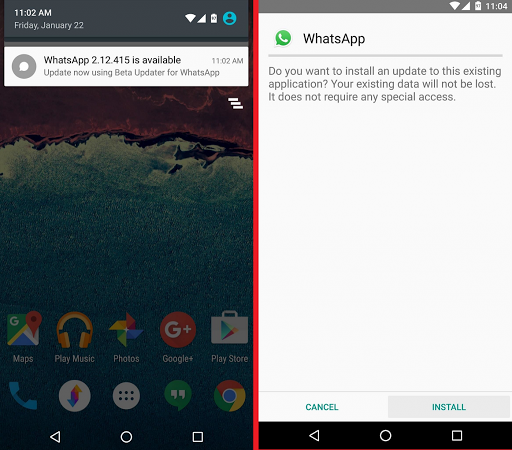 However, you can enable “Auto-download updates” to automatically update the WhatsApp beta app right away. In the future when you want to install the latest update and get latest WhatsApp features on your Android, open up the app. Tap on the first notification and press “Install” on the following screen to get the latest WhatsApp beta version. Since all of the beta versions of WhatsApp that you download are official, you don’t have to worry about losing your chats. The latest update will be installed on top of your current WhatsApp beta app, and all of your content will automatically be restored..